Dear neighbors, I have a confession to make: I haven’t always appreciated green beans. As a kid growing up on a farm in France where my grandfather did all the gardening, I knew they meant a lot of work, hours taken away from my precious books, every time Pépé arrived carrying bucket loads of them. My job was to snap off each end so my mother could boil or preserve them in jars. This method, typical of where we live, invariably resulted in soft, overcooked beans. Blah… Parsley or garlic had to be added for flavor. Later in life, going to college and living in Clermont-Ferrand, the regional capital, my roommate and I bought our green beans already canned in the local supermarket. Blah again. We only ate them because we tried to add some green stuff to our plates. Good girls. A few years on, newly married and moving to the States, I grew to positively hate beans. Those things in the cans we got were a far cry from my dear Pépé’s haricots verts, being much thicker in size, according to the erroneous notion that “bigger is better”, and the taste, oh, the taste… Mega-blah. To make it worse, for some reason they often had a bitter after taste. After we came back to France, we started growing our own; my husband tells me there is nothing to it, as long as they get water, especially at first. We have never resorted to the use of pesticides. Over the span of twenty-some years, whenever they got attacked by bugs (aphids? ), I sprayed them with a potion made from garlic cloves boiled in water and let to sit overnight. The ones we have this year are healthy, they even survived the bad frost we had back in May. And so, for the past five days I have been picking beans instead of blogging. Not an easy task. Actually back breaking. But worth every single ache. At first I was hoping I could pick them on my knees, as I did for the peas, but there isn’t enough space between the rows. So I bend over and retrospectively feel grateful for all the work my grandfather used to do for my family. By the way, I have found it’s best to go through the rows twice when picking beans, in opposite directions: they are very good at the art of camouflage and it is easy to miss several. After they have been picked, I have to cut their ends, and that takes a bit of time too, even using both hands! But then comes the reward: our beans, fresh from the garden, picked before they grow too big and hard, and cooked my simple way, are so good even my picky husband goes for seconds. If you don’t have a garden, dear neighbor, first I hope you forgive me for writing such a long post about this humble vegetable, and secondly I hope you can find them fresh where you live, be it at your local farmers market or in a store. In the States you will find them under the label “haricots“. They are a thinner variety of string beans. One of my dearest neighbors was wondering what kind of creative bean recipe I would come up with. Well, this is a case where simplicity is best. Of course, you can always add garlic (if tolerated) or herbs but I would advise you to first try them cooked “au naturel”. No additives, no sulfites. Just fresh haricots verts. Bon appétit ! *Apparently the word haricot comes from the Aztec word ayacotl. Don’t you love how it’s been a global world all along? 1. Wash beans and pat dry. Make sure you remove all moisture to prevent splattering. 2. Heat about a TBSP of oil in skillet. When hot, dump beans inside, trying not to overcrowd them. If need be, cook several batches… or use a larger skillet. It will be easier to cook the beans evenly. 3. Lower the heat and watch the beans turn a vibrant green color, stirring occasionally. When the color is the same for all the beans, add some water to the pan and cover with a lid. The beans will now be steamed for a couple more minutes. The water should evaporate almost, if not, completely. Test for desired doneness. Add more water and resume cooking if necessary. Unlike my parents and their parents, we personally like our vegetables to retain some crunchiness. Salt may be added at this point. served with leftovers from another meal: peppers and tofu. Note that this is my plate, not my husband’s: he can’t have tofu and he was too hungry to let me take a photo of his plate! Cover with a wet cloth and keep in a closed plastic container. I bring water to a boil in a large pot, then drop some beans and count 30 seconds after boiling has resumed. I remove them with a slotted spoon and stop further cooking by placing them under running cold water. 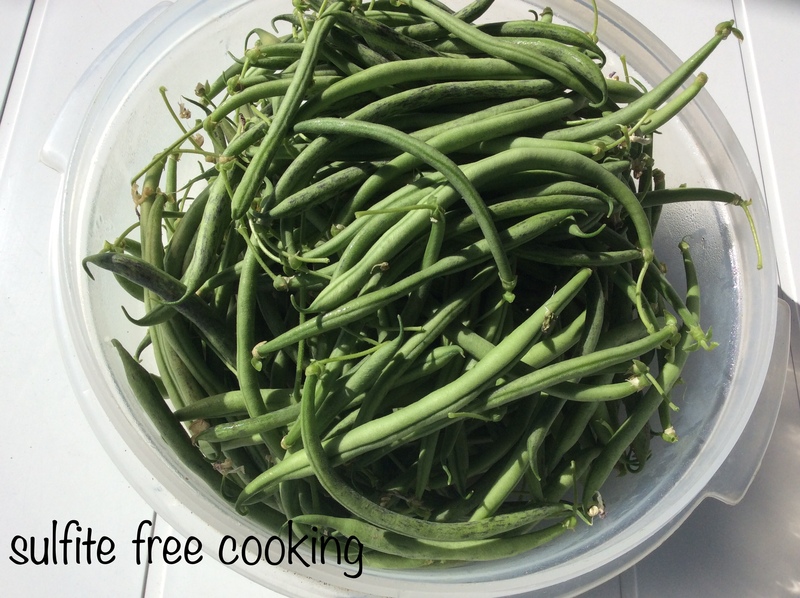 Finally, I thoroughly pat the beans dry before arranging them in a freezer bag. Note: Don’t boil too many beans at a time: it would result in a longer hot bath and overcook them; here the idea is to pre-cook them only. Previous versatile, easy-to-make patties in three versions… and my true nature revealed! Simple and delicious! Thanks for the tips about freezing beans. You’re welcome 😊! I cook my frozen beans the same way, except that the process is much faster. An edifying read and an incredible harvest. I’m just after picking more of our sugar-snaps, we’re like two peas in a pod you and I. The only bean I have this year is one solitary runner bean. The weather wasn’t kind to them at all. Funnily I’ve been spraying my plants too, with a garlic spray also, I’m getting worried about this, dear neighbour, we may start writing the same articles yet. Though that might save me some work. Take care. This morning was taken up by more bean picking, and (shush!) weeding of my flower beds. And yes, I paid attention to where I put my feet. I think I may have worked myself a little too hard, but it was just too tempting after the rain had made everything so easy to pluck! Will be sitting most of the afternoon catching up on my neighbors’ latest posts.